Hello, I’m Shobha, a total sports addict and an outdoor junkie. I feed off the adrenaline rush I get from extreme outdoor activities. 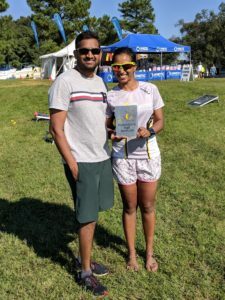 Got into the world of triathlons since 2014 and absolutely love the sport. I have completed and placed in several triathlons from Sprint to Half Ironman distances. Very fortunate to have an amazing husband whose support and encouragement has got me to where I am today in this sport. As an ambassador I want to give back to this community by encouraging people from different backgrounds to enter this sport and grow awareness and participation of triathlon to first timer triathletes.